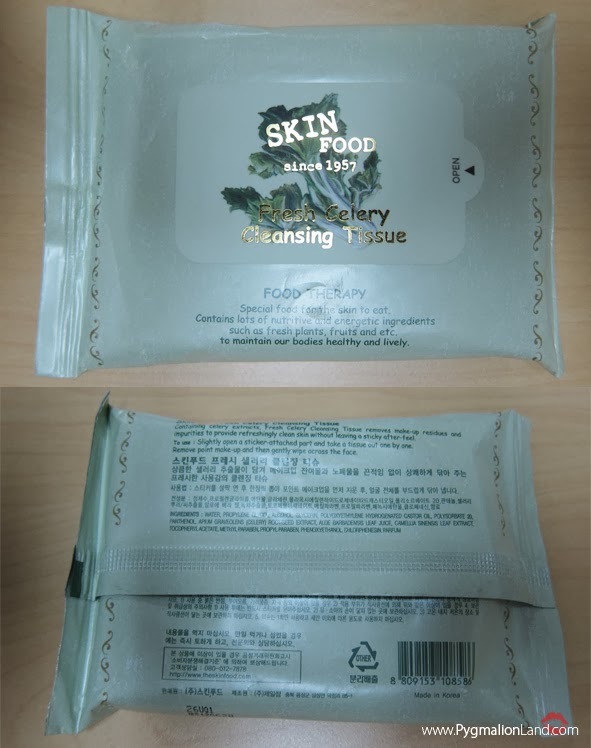 Sometimes it confused us, which one is suitable for our skin since there are a lot of cleansing tissue variants in market, from various brand with various ingredients. The worst part, you can't find any sample to try them out first to make sure the product that you're decided to buy works perfectly for you. 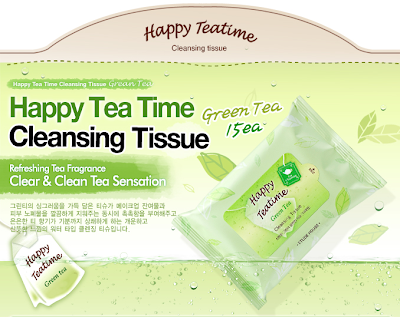 What is the main purpose of this cleansing tissue anyway? As for me, this is a shortcut or to skip my cleansing routine whenever i'm on vacation or away from home for couple a days. It's convenient & easy to travel with. Prevent from any break out if you're too tired to wash your face especially when you're wandering around whole day outside hotel. I can simply clean my mascara, eyeliner or even BB cream. It's sooth and clean your skin well enough to continue it with your regular facial wash. 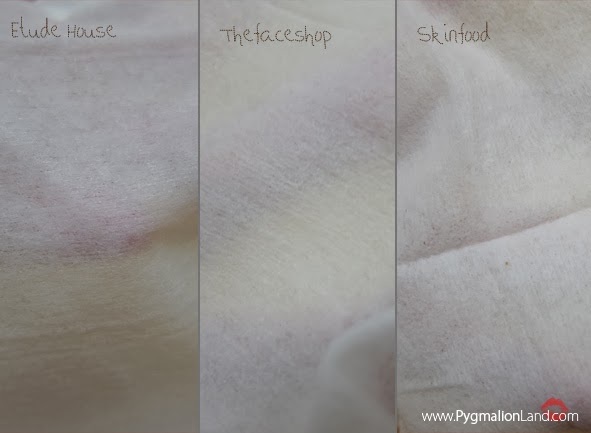 In this post, I'm gonna share which product that i find suitable for my skin. Korean product nowadays were in my skincare regime, since they develop quite nice packaging along with new improvement of basic skin care ingredients. Etude House, Thefaceshop and skinfood are some well known product from korea, and hope you can find a good comparison from these 3 products to buy. 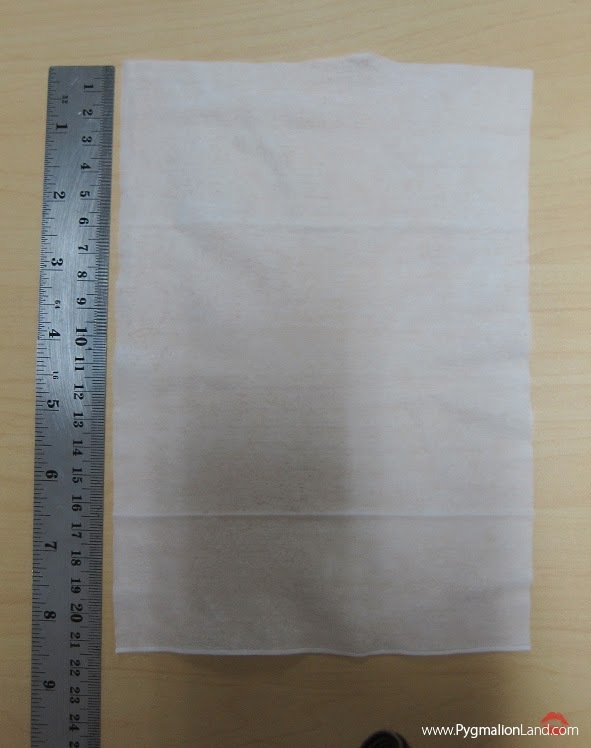 I can assure you, the size of this product are almost the same from 19-21 cm long, folded in box square to squeeze in their packaging. Etude House (21cm) , TheFaceshop (20,5cm) and Skinfood (19cm). 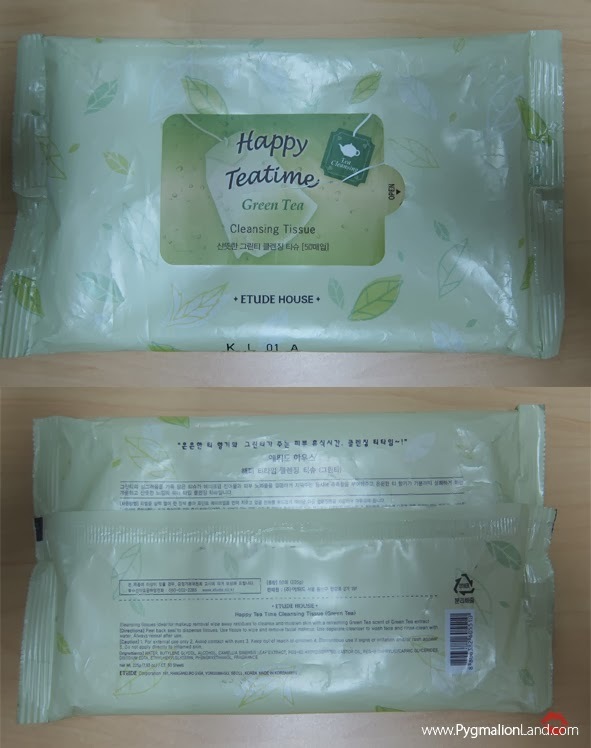 This product smeels like it stated, green tea aroma. 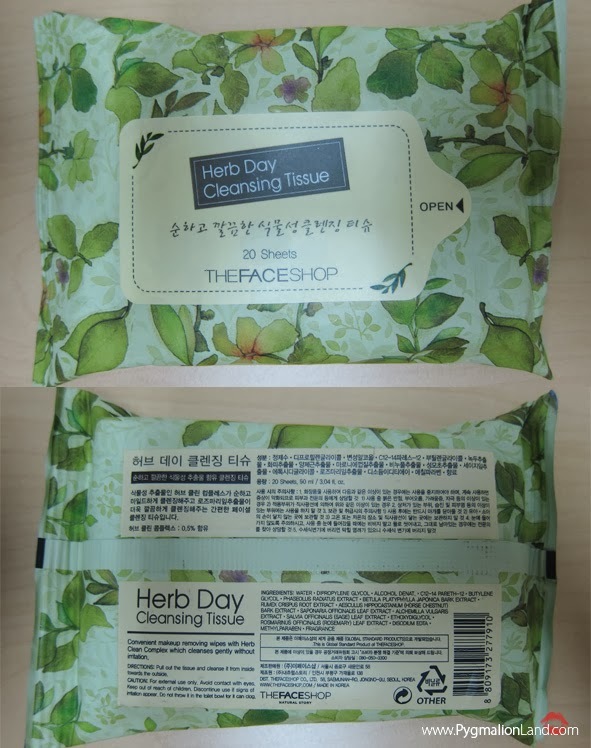 it comes in small packaging contains of 15 sheets, i bought 50 sheets since it's so cheap in Korea. 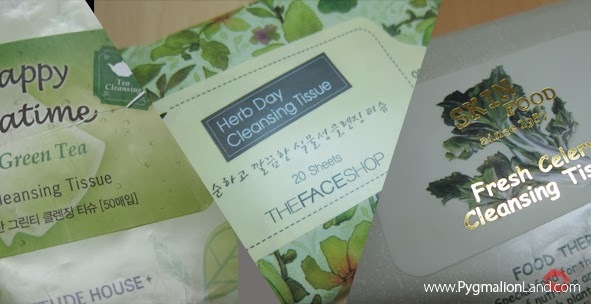 The package states : ideal for makeup removal which cleanses and moisturizes your skin at the same time. The sheets are soft to the skin and cleans well. It feels supple after you cleans your face, but however it doesnt work very well in waterproof mascara or eyeliner, you need an extra effort to remove them. And i also feel a little bit itchy and dry after using this product, i think because this product contains alcohol and it irritated my skin a bit. But when it comes to oily skin, 3 of my friends don't complain any about this product. They love how this product swipe all the dirt in seconds and leave it matte. This product becomes dry faster that other 2 ( i put 3 of this products in fridge). This is by far are my most favorite cleansing wipes, been used this product for almost 4 years. It has a herb smells but tolerable, since it smeels fresh. The wipes itself are soaked enough to moist my whole face. And it dries quickly and gives you a finish matte without leaving any greasy feeling. This product are suitable for all skin types, especially the oily one. It's removing light to moderate makeup, as for waterproof foundation or makeup i suggest to continue with cleansing cream to achieve clean face. Doesn't cause any allergic reaction or you might say, i don't experience any break out at all. It kept my face hydrated. Last but not least, from one of my favorite skincare korea brand, Skinfood. Well, it does smells a bit weird. But it turn out, this product also can removes make-up residues and impurities to provide refreshingly clean skin without a sticky after-feel. It does clean light and moderate makeup, but like those two above, for heavy waterproof makeup or foundation you need extra cleaner. 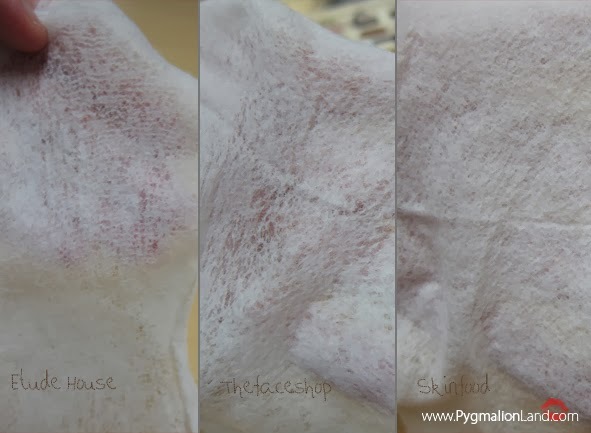 It doesn't leave any sticky residue and keep my skin hydrated. I don't have any allergic reaction nor break out. It just i don't fond it's smells. 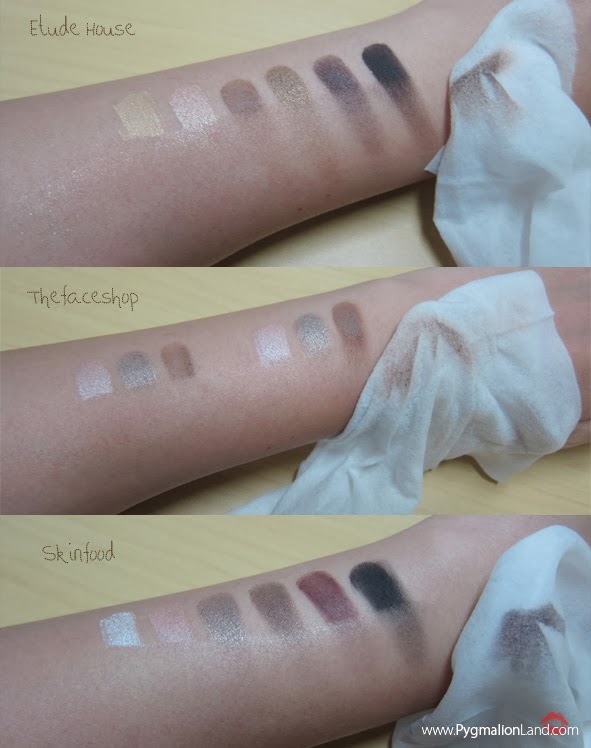 what they can do in cleansing pigmented eyeshadow. This is when i tried to pull them apart as hard as i can.